Marvel Comics staged a telephone news conference on Thursday, centering on the upcoming wedding of Black Panther and Storm. Black Panther writer Reginald Hudlin and Storm writer Eric Jerome Dickey were featured. For highlights, with more than a dozen images, CLICK HERE. DC Comics has announced that 52, its weekly series starting on May 10, will feature a cover price of $2.50. The weekly DCU series is written by Geoff Johns, Grant Morrison, Greg Rucka and Mark Waid, with layouts by Keith Giffen and covers by J.G. Jones. The first four issues will feature art by Joe Bennett and Ruy Jose. In addition, beginning with Week 2, the series will include the 10-part back-up feature "The History of the DC Universe," written and pencilled by Dan Jurgens with inks by Art Thibert. "This is one of the most extraordinary and challenging projects ever to come from DC Comics," said Dan DiDio, Senior VP -- Executive Editor, DCU. "We are the only publisher that has the ability to deliver quality and excitement like this on a weekly basis." "We've been working with Diamond and the retail community to help retailers stock 52 appropriately and to make it an event that will bring fans into comics shops each and every week," said Bob Wayne, DC's VP-Sales. "With that in mind, we will not collect or reprint any chapter of 52 until the final issue is published in 2007." For covers and five- to six-page previews of Marvel Comics Comics titles arriving in stores on Feb. 1, CLICK HERE. Titles include Uncanny X-Men #469, The Sentry #5, Spider-Girl #95, X-Men: The End -- Men and X-Men #2, Underworld #1, New Excalibur #4, Marvel Adventures Spider-Man #12, Marvel Romance Redux #1, X-Factor #3 and I (Heart) Marvel: My Mutant Heart. For covers and three-page previews of upcoming DC Comics titles, CLICK HERE. Titles include Batman and the Monster Men #4, Seven Soldiers: Bulleteer #3, The Exterminators #2, Hard Time Season Two #3, Thunderbolt Jaxon #1 and Y: The Last Man #42. IMAX and Warner Bros. have announced that the V For Vendetta film will be simultaneously released to IMAX and conventional theatres on March 17. Produced by Joel Silver and the Wachowski Brothers, directed by James McTeigue and starring Natalie Portman, V For Vendetta will be digitally re-mastered through IMAX DMR (Digital Re-mastering) technology. Warner Bros. Pictures will be the exclusive distributor of the film to IMAX theatres worldwide. The addition of V For Vendetta gives IMAX five new digitally re-mastered Hollywood films -- including two in IMAX 3D -- scheduled to be released day-and-date to IMAX theatres this year. "We're excited to give fans the opportunity to experience V For Vendetta in IMAX's spectacular format," Silver said. "The clarity and immersive quality of The IMAX Experience adds a dynamic dimension to the film's powerful visuals, breathtaking action and multi-layered storytelling." 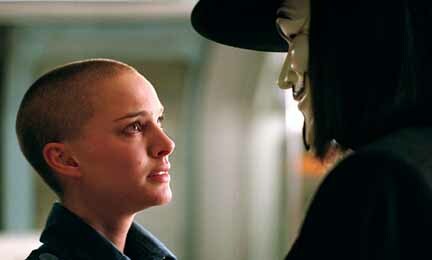 Look for more on V for Vendetta soon here in The Continuum. To promote its upcoming Untold Tales of the New Universe specials, Marvel Comics will include an eight-page Kickers, Inc. story in New Avengers #16. Marvel is removing all advertising from that issue, which goes on sale on Feb. 15. In addition, Amazing Fantasy #19, which goes on sale on March 22, will include an eight-page Spitfire story. On Thursday, Marvel released a preview of the Kickers, Inc. story as well as the covers to the Untold Tales of the New Universe titles Nightmask, Justice, Psi-Force, Starbrand and DP7. * Marvel Comics' The Runaways Vol. #1 HC, collecting all of the issues #1-18 of the series' first volume, has made the Top Ten list for Best Books for Young Adults for 2006, as named by the American Library Association. Runaways is the only graphic novel to make the list. Marvel is offering a new X-Men/Runaways story as part of Free Comic Book Day offering. * According to the Hollywood Reporter, CBS has ordered a pilot based on the Image Comics' Ultra, by the Luna brothers. Joan of Arcadia creator Barbara Hall wrote the script. * Dynamite Entertainment has announced an agreement with Universal Studios Consumer Products Group to produce comics featuring Xena. Creative teams and launch dates will be announced.